Rally Racing News Leader in the USA | Rally World News Rally World News: RALLYCROSS HITS THE AIRWAVES STARTING IN OCTOBER ON NBC’S WORLD OF ADVENTURE SPORTS! RALLYCROSS HITS THE AIRWAVES STARTING IN OCTOBER ON NBC’S WORLD OF ADVENTURE SPORTS! All the great results and event highlights from the inaugural 2010 RallyCar rallycross season are coming to broadcast television this fall as featured content on NBC’s World of Adventure Sports. Four rounds of rallycross from New Jersey Motorsports Park, where the U.S. was introduced to rally cars competing wheel-to-wheel on a short tarmac and dirt course, will be highlighted in multiple episodes airing throughout the remaining 2010 season and into 2011. The World of Adventure Sports; a multiple time Emmy Award nominee and winner is a leader in capturing the globe’s most demanding sports, combining incredible action and behind-the-scenes content with high level story telling production. Additional 2011 Schedule times will be announced in the coming weeks. Boasting huge audiences and a very diverse fan base in Europe, rallycross sits at the intersection of rally, drifting, and road racing disciplines and features stars from each respective autosport. It is widely believed that rallycross racing in America is changing the face of motorsports, attracting teams from around the world and bringing exotic racecars never seen on American soil to compete against the U.S.A.’s best drivers. 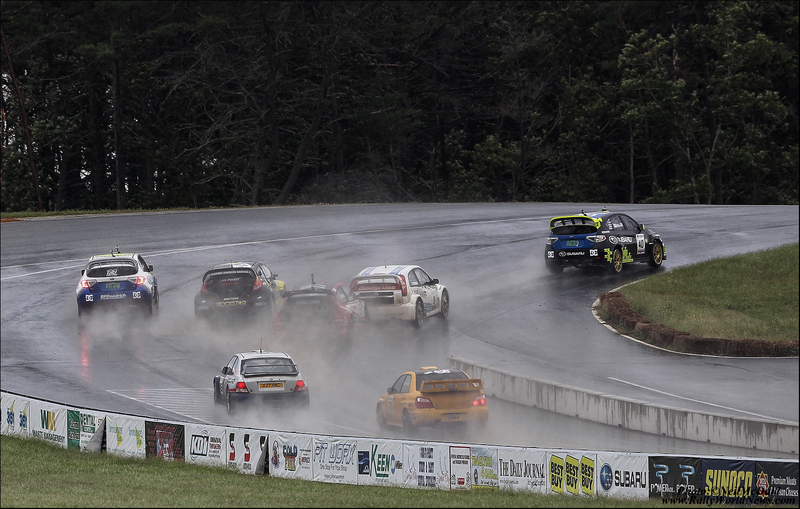 A race consists of five rally style cars jumping and sliding on a road course made up of pavement AND dirt. Five drivers line up to start at once, piloting high-horsepower compact cars through race traffic over a challenging short course that features jumps, unbanked turns, hills and transitions between pavement and gravel. Each car must also take a “Joker” lap at some point during their heat. A Joker Lap is a small detour that adds a level of unpredictability to the heat’s outcome by changing a driver’s strategy in an instant. "It's an incredibly challenging and aggressive sport," said driver Tanner Foust, who has been competing in European championship events this season. "The action is non-stop and the fans can't get enough of it." RallyCar’s initial events have attracted top talent from the European Rallycross Championship (ERC) as their season ended in September to compete against U.S.A.’s finest. The European teams brought exotic racing machines never before seen in America, such as Liam Doran’s 2009 Citroen C4 and Frode Holte’s 2010 Volvo C30. Each of these machines packs a punch powered by 550 horsepower engines, All-Wheel-Drive drivetrains, and two second 0-60mph acceleration times. They are joined by Sverre Isachsen, two time ERC Champion in rounds 3 and 4. World of Adventure Sports will chronicle the European challenge as the U.S.A. brings out their top guns; Subaru Rally Team USA’s Travis Pastrana and Dave Mirra, and Rockstar Energy Drink’s Tanner Foust, who won the first two RallyCar rallycross rounds. The competition became even more interesting with the addition of New Zealand’s Rhys Millen, 2005 Formula DRIFT Champ and ex-Mitsubishi Rally Team driver, who arrived with a 2008 Hyundai Accent that was originally campaigned in the World Rally Championships. Sponsors of the World of Adventure Sports include Red Bull, Garmin, Oakley, Progressive and BFGoodrich. Aura360 specializes in animating client brands through innovative event and media properties and related marketing ventures. Aura360’s services are structured into three operating units; Ownership & Ventures, Client Property Development & Management, and Productions. Allied business 360 Productions provides global video production services. For more information please visit www.aura360.com or www.360Productionsgroup.com.